Before having a comparison with the Vodafone Prepaid and Postpaid let me tell you few things. 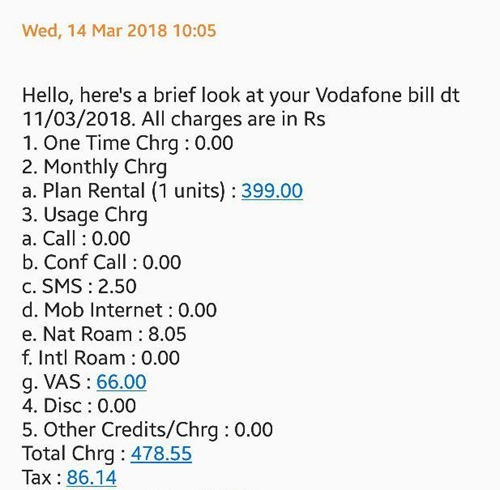 Am a Vodafone postpaid customer, I am using their 399 monthly rental plan. Earlier I was getting unlimited calls and 1 GB of 4G/3G Data/month (yeah 1GB for a month). Later I went to their office and asked I just wanted to switch to Prepaid, they changed the 1GB/Month to 1GB/Day. Remember I had to go to their office and contact them for this. Later they added 300 Free SMS too to the plan. Now Let us have a comparison with a Prepaid and postpaid plan. The postpaid plan am currently using with monthly rental 399. Including Tax and other things my last month bill is around 500 Rs. The plan is having Unlimited National, STD, Roaming calls, 300 SMS/Month, 1 GB of 4G/3G data per day. So for the amount I pay for a month, I can get more benefits that too for 3 months. Also there is more options to top-up what you need as per your requirements. I seriously believe that this will be the case with most of the postpaid plans. So what you think, is there is any specific reason why I should stay with postpaid plans ? Are you a postpaid cutomer ? Just have a look and decide which one is better for you.